Institutional Review Blog: Anthropologist: IRBs Create "the Worst of Possible Worlds"
Anthropologist: IRBs Create "the Worst of Possible Worlds"
Jonathan Stillo, a PhD candidate in medical anthropology at the CUNY Graduate Center, writes with great sensitivity of the ethical challenges he faced while studying mortally ill patients at a tuberculosis sanatorium in Romania. 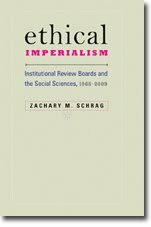 He suggests that IRB review was at best an irrelevance and at worst a hindrance to his efforts at ethical research. The background is this: Stillo "spent over two years studying TB and much of that was spent talking to dying people and sometimes even holding their hands while they died. The field site was amazing—visually stunning, but tragic. It was a place of abandonment where many patients would go to die, not just of TB, but also of its complicating factors: poverty and hopelessness." Doing this research meant getting close to people suffering from pain, despair, and even the guilt that they had infected loved ones with an incurable disease. Eventually, he won their trust by talking to them about their lives, something doctors were unwilling to do. Part of my initial problem was I didn't know how to ask the patients to let me interview and survey them. Following my IRB protocol, I showed them my stamped informed consent, a full page of Romanian legalese with talk of risks and benefits. I would read sections out loud and the more "informed" the patients became the more uncomfortable they became. This level of formality does not exist in most aspects of their lives. They could not understand that if I only wanted to talk with them, why I needed such involved paperwork with multiple signatures, dates and stamps. In fact, when I submitted my original protocol to the Romanian medical ethics board, I was laughed at and told that this research did not need approval because it was not "clinical". What did patients care about? That I would protect their identities and that the process was voluntary. Everything else, including talk of risks and benefits, names and numbers of people to contact, made them uncomfortable. They just wanted my assurance that I would maintain their confidentiality by not publishing their names. Many patients did not even have an expectation of privacy and did not feel qualified to make the decision as to whether or not they should participate in my research. They did not want to hear about protocols. Rather, they wanted someone that they trusted to tell them it was ok and that they could trust me. A document from my IRB could not accomplish this, only someone else vouching for me could . . . Ultimately consent, at least in my research site, has little to do with my protocols and institutional approvals. For the patients informed consent is not something I read out loud to them, it is earned over the course of months through drinking coffee, staring off the balcony and exchanging stories of our families. It is something I take seriously not because of the IRB, but because I know that the people sharing their lives with me trust me on a personal level. I owe it to them to behave in a way that is ethically appropriate and respects their humanity and dignity. I think at this point we have a system of ethics approval which is designed by clinicians and enforced by lawyers for the protection of hospital and university endowments in a litigious society. It is the worst of possible worlds and despite best intentions 20 years from now, future researchers will read of all of the unethical research that took place even in this age of IRBs. In short, the IRB forced Stillo to adopt an approach that made dying people uncomfortable. Only when he abandoned that approach could he bring them comfort instead. I've always been confused by IRB guidelines for reasons exactly like these. In fact, this confusion is part of why I don't do the kind of research that requires IRB protocol. I can't imagine developing meaningful relationships with people while being bound to this kind of strict and highly limited interpretation of ethics. It's like an institutionalized codification and reduction of what it means to have an ethical relationship with another human being. Like you, I've found that the lengthy IRB consent form I need to pass across the desk often has the opposite effect from what is intended. Rather than instilling my interviewee with trust someone is indeed supervising, and that clear boundaries have been demarcated, it instead heightens awareness to a place of suspicion that hadn't been there before. "I thought this was just an interview about this neighborhood in the 70s?" Suddenly they're wary of being trapped– very different from your TB patients, but similarly besides the point of what I am trying to do/create. "What am I signing away my rights to? Are you trying to 'catch' me saying something about gentrification (or affordable housing or artists or local politics) that will soon come back to bite me?" While I would never ignore the historical need for safeguards that attempt to root out flatly unethical behavior in the name of "research," you've highlighted the many ways in which the current IRB protocols can miss the mark. And for certain projects, it can turn a normal discussion– in which questions should be freely raised by either party– into a three-party conversation, with the anonymous IRB as the unknown quantity. NOTE: Stillo does believe that "There is definitely a role for ethics reviews, especially in fields such as medicine where lives are at stake." But I wonder if this belief is based on serious investigation or the CITI Program indoctrination he received. One sign of an incomplete understanding of medical history is his captioning of a photograph, "Tuskegee syphilis study doctor injects subject with placebo." As Susan Reverby notes in Examining Tuskegee, p. 288, the rubber tubing on the subject's arm indicates that blood is being drawn. What are the details of this research that disqualify it from a §46.101(2)(b)(2) exemption? Good question. I think the answer is that CUNY doesn't believe that exempt means exempt. CUNY policy dictates that only IRB chairs or members can determine a project to be exempt, and that "The individual making the determination of exemption has the authority to require additional protections for subjects in keeping with the guidelines of the Belmont Report, even though the research falls within an exempt category." In other words, the IRB will do whatever it pleases.